Good nutrition for women begins with all of the basics such as fresh fruits and veggies, lean sources of protein, whole grains and healthy fats. These important basics give women energy, mood support, weight maintenance and healthy looking skin. It is important that as a woman your food focus is on plant based foods first and foremost. You want the majority of the foods on your plate to consist of fresh fruits and leafy green veggies. Also incorporate beans, whole grains and legumes to help keep you going all day long. 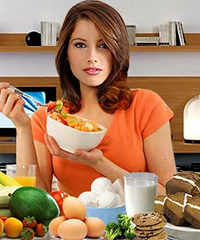 Calcium is also important for a woman’s nutritional needs. While dairy products contain a good amount of calcium they also have animal fat which can increase bone loss. Instead, opt for sources of calcium that are plant based such as collard greens, broccoli, Brussels sprouts and kale. Iron is essential for women since most do not get enough in their diet. Be certain that you get enough iron by eating foods like dark poultry meat, cereals that are iron fortified, lean red meat, almonds and spinach. Reducing your intake of alcohol and caffeine is important to preventing things like osteoporosis. Women that drink more than two alcoholic drinks per day are at an increased risk of developing osteoporosis. Drinking too much caffeine messes with hormone levels. It is recommended that you drink no more than one glass of alcohol per day and one cup of caffeine a day. Eating too much protein is actually dangerous for women. Eating excessive animal based proteins can causes calcium loss which can lead to conditions such as osteoporosis over the course of time.